Mykhailyna Khomivna Kotsiubynska is the niece of the Ukrainian literary great Mykhailo Kotsiubynsky. Since early childhood she had a unique opportunity to socialize with personalities that had shaped the culture of whole generations. Her family home was frequented by the prominent writers Pavlo Tychyna, Maksym Rylsky, Volodymyr Sosiura, Mykhailo Stelmakh, film director Mark Donskoy, Ginzburg the sculptor, the singer Zoya Haiday, the artists Vasyl Kasiyan and Mykola Burachek, and many others. In the 1960s she participated in a protest against the arrests of Ukrainian intellectuals during the screening of Serhiy Paradzhanov’s film “Shadows of Forgotten Ancestors” at Kyiv’s Ukrayina movie theater. She used her typewriter to make the first samizdat copy of Ivan Dziuba’s book Internationalism or Russification? She spoke out in defense of numerous Ukrainian dissidents. Yevhen Sverstiuk, Alla Horska, Ivan Dziuba, Vasyl Stus, and Borys Antonenko-Davydovych were her associates, friends, and teachers. Mykhailyna Kotsiubynska is a literary critic and the compiler of Doroha boliu [The Road of Pain], Vasyl Stus’s first collection of poetry to be published in Ukraine, and the six volumes (nine books) of his literary heritage. She is the editor of four volumes of correspondence with Mykhailo Kotsiubynsky, as well as numerous books that were published as part of the “Modern Ukrainian Literature” series. She is the author of the books Obrazne slovo v literaturnomu tvori [Figurative Speech in Literary Works], Etiudy pro poetyku Shevchenka [Studies on Shevchenko’s Poeticism], and the two-volume Moyi obriyi [My Horizons]. The latter has been nominated for the 2005 Shevchenko Prize. “I recently completed and submitted to the publisher what I think is a very interesting manuscript entitled Nad mamynymy shchodennykamy [Mother’s Diaries]. My mother left six notebooks of diaries spanning the years 1928 to 1963. Reading them was like seeing myself growing up through her eyes. I lived in an atmosphere marked by the omnipresence of Kotsiubynsky. I pictured my uncle as ‘tall, a little stoop-shouldered, spruced up, and worthy of himself.’ This is Tychyna’s description of him, which I like very much. I was born in Vinnytsia, in the same house and room where he was born. It is an old house, some two hundred years old. Fortunately, it has been reinforced, so it will hold together for a lot longer. My parents founded the writer’s museum. We had two tiny rooms, and the rest of the house was used for the exhibition. ‘As I was leaving the room, I spotted Mykhailyna in the room where the tour had just gotten underway. I was about to lead her away, but then changed my mind. She was listening attentively,’ my mother wrote in her memoirs. I grew up in an organic environment that was inseparable from the personality of the classic Ukrainian writer, his work, and the people involved in it. I know that even our critics would carp at us because we didn’t separate the museum property from ours. Indeed, the museums in Vinnytsia and Chernihiv were my parents’ life. I have already mentioned the following revealing incident on several occasions. 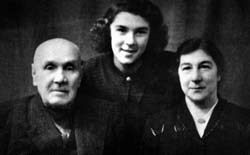 In 1941, when the Germans were approaching Chernihiv, my father was told to evacuate his wife and daughter and pack only a few suitcases. But he refused to leave without his museum. Somehow he got his way and obtained a freight car onto which he loaded almost all the exhibits, even the bust sculpted by Ginzburg, for which Kotsiubynsky had posed. The manuscripts were packed in a separate metal-plated trunk. On August 23 this freight car was standing at the Chernihiv rail terminal. By that time almost everything around us had been razed to the ground; in September the Germans would enter the city. There was continuous bombardment. I remember during the night debris was hitting the roof with such force that it felt as if there was no place where you could hide from it. My parents sat me on the trunk with the manuscripts and covered me with their bodies on both sides. The manuscripts and I were the most precious things. “It both helped and hindered me. During the difficult period when I was hounded from every place — expelled from the party and the Literature Institute, and banned from publishing my literary criticism (this lasted for nearly twenty years) — if it hadn’t been for my last name, I may have shared the tragic lot of Ivan Svitlychny or Vasyl Stus. At the same time it was an impediment. I couldn’t even get a job as a proofreader at a technical magazine. After I was expelled from the Literature Institute in 1968, I was unemployed for almost a year with a five-year-old daughter on my hands. Then I had a stroke of luck. I’m not 100 percent sure that this happened exactly as I was told. 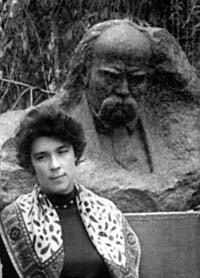 I was friends with a Communist from Canada named Maria Skrypnyk, who was known for her English translations of Taras Shevchenko’s poetry. She had graduated from a party school in Kyiv. Hearing about my plight, she approached the secretary of the Communist Party of Canada William Kashtan, with whom she was on friendly terms. They appealed to our party leadership, saying that all this fuss about the niece of the classic Ukrainian writer was harming the Soviet Union’s image. Strings were pulled to get me a job at the Vyshcha Shkola publishing house. Of course, they kept tabs on me there, but at least I could earn a living and had the respect of my colleagues. “A portrait of the young Tychyna hung above my crib: a young, somewhat ascetic, inspired face with delicate features. “When I grew up, Tychyna insisted that I enroll in the Ukrainian Philology Department of Kyiv University. “I have written that for me the poems of the early, brilliant Tychyna symbolized spiritual freedom, music, and art. I never bothered to find out why his “clarinets” were “sunny.” I perceived them as holistic, organic images. So the public’s ambiguous, to put it mildly, attitude toward the poet always hurt me, even though there was a certain reason for it. I remember when I was in the tenth grade, my classmates made fun of some of his poems. I started crying: ‘But you don’t know “The Sunny Clarinets”! To appreciate Tychyna, you have to pull away from the ground and look into the sky!’ And I ran out of the classroom. From then on they never said anything bad in my presence. I called my memoirs about Pavlo Tychyna With Love and Pain. “My father started the museum, the writer’s daughter Iryna picked it up from him, followed by his grandson Yuliy, and now his great-grandson Ihor is doing a good job of managing the museum in Chernihiv. Unfortunately, the locals do not have much appreciation for culture, and are not helping the museum as they should. When I was awarded the Mykhailo Kotsiubynsky Prize, I tried to explain that the museum is Chernihiv’s mark on the cultural map of the world. In the Soviet period, visits to the museum were a kind of ideological ritual: they were trying to impute socialist realism to Kotsiubynsky. Strangely enough, the museum is no longer included in tourist itineraries. We have to change this. In his lifetime, Kotsiubynsky’s home in Chernihiv was a major cultural hub. “We are saying that we must integrate into the European cultural space. Meanwhile, letters from Moscow, Petersburg, Krakow, Bucharest, Stockholm, etc. were mailed to this out-of-the-way Chernihiv, beginning in 1891 until 1913, when Kotsiubynsky died. Letters from the writer Volodymyr Vynnychenko, the scientist Volodymyr Hnatiuk, the composer Mykola Leontovych, the public figure and philanthropist Yevhen Chykalenko have all been preserved. They convey what we call culturalism, yet this was culturalism of a high, dignified level. These people lived as one with Ukrainian culture, steering clear of cultural Little-Russianism and provinciality. “I do write letters, but I don’t have all that many living friends out there, in Germany, Canada. And all of my relatives are close by. I recently read that one contemporary writer admitted that his computer is his head and hands. So I think that we should not underestimate electronic messages, as they also carry emotions. On the other hand, Ukrainians have a unique, classic epistolary heritage. The letters of Lesia Ukrayinka, Vasyl Stus, and Kateryna Bilokur alone represent epistolarity of the highest order. “I’m not a big optimist, but I honestly see the beginnings of a civil society in the social sentiments and changes that I have been observing for the past half-year. I’m always impressed primarily with details, revealing details. During the Orange Revolution, my daughter’s mother-in-law, who is very distant from politics, went to Independence Square every day to help in any way she could, despite her broken arm. She was a changed person, with her head held high and her shoulders squared. And there were many people like her. When I woke up at six in the morning on those worrisome days in November and December, I saw people walking into the darkness from nearby buildings, dressed warmly and wearing the obligatory item of orange clothing or decoration. They gathered in groups and headed for Independence Square. They were no longer a crowd, but something loftier. That we inherited from the ape. And not to straighten our backs. “In my case, my second life began in the 1960s. I never pursued a career in the Komsomol, but remained an ‘ideological virgin,’ and I believed in the ideals of the society in which I was raised. I consciously avoided some aspects of this society and simply didn’t know many things. And when I communicated with these people, I saw a colossal field of knowledge opening up before me, I simply went toward them. Of course, we were living in a difficult period. But I was always surrounded by incredibly interesting and sincere people whom I respected and loved. Even though Saint-Exupery’s saying, ‘The only luxury is the luxury of human communication,’ is overused, it still has a lot of meaning for me. I have always had this luxury. My meeting with Yevhen Sverstiuk was extremely important, even though our experience and upbringing were different. I grew up in a happy, intellectual, and bilingual environment, and absorbed Russian cultural values from my mother. They are still dear to me. He grew up in a different environment with other values. For example, his brother served in the Ukrainian Insurgent Army (UPA), which was then a terra incognita for me. The triviality that pales before plant lice. “Vasyl was a postgraduate student at the Literature Institute and I was a senior researcher. At first we weren’t that close because a six-year age difference is a lot when you’re young. We became closer after he fell out of grace, after the screening of Serhiy Paradzhanov’s film “Shadows of Forgotten Ancestors” at Kyiv’s Ukrayina cinema. Then Ivan Dziuba told us about the arrests of Ukrainian intellectuals, and people stood up in protest. Vasyl was shouting something desperate in support of Chornovil’s call for ‘all those who oppose tyranny to rise.’ When Stus sat down, I hugged him and felt every cell in him trembling. ‘Poor boy, how will you live in this world?’ I thought then. Two or three days later he was expelled from his postgraduate course. He was ashen when he left the director’s office, saying: ‘I told him everything I thought!’ They wouldn’t hire him to work in the subway because he was too educated. Vasyl got a job as a stoker at the stokehold of the Republican Institute of Gardening in Feofania outside Kyiv. Svitlana Kyrychenko and I would bring him hot soup, because already then he was suffering from stomach disorders. “Every once in a while we went to the theater and the philharmonic. Stus especially liked Beethoven and Bach. A concert of Robert Shaw’s choir from the US left the most vivid impressions. Once we went to see the satirical comedy “Dion,” an allusion to modern times. On our way home Stus recited poetry. ‘Would you like an autograph?’ he asked me suddenly and handed me a slip of paper. I placed it inside my notebook and forgot about it for many years. When I was preparing his poetry for publication, I came across this slip of paper. It contained seven miniature verses from 1971, which were similar to his cycle “Veselyi tsvyntar” [The Merry Cemetery]. “Our relations were more qualitative than quantitative. Vasyl was friends with his fellow students; he had a girlfriend, and then a wife, Valentyna Popeliukh. But we also had mutual friends: Zina Genyk-Berezovska from Prague, Danylo Shumuk, Alla Horska, the Horyn brothers, Nadia and Ivan Svitlychny, Yevhen Sverstiuk. One of the brightest moments in our life was the so-called Prypyat Republic. We took boats out on the Prypyat River and lived there for several weeks in the summertime. I recall one warm summer night. The camp was preparing for some sort of performance. We fried loads of fish. Everybody was decked out: the women in their best swimsuits and the men in swimming trunks with paper bowties around their necks. Suddenly the kitchen pot orchestra struck up a tune. A boat appeared from behind an island with two mermaids and Neptune covered in water lilies and wearing a crown. So tall and majestic, it was our Vasyl Stus. “Our correspondence meant a great deal to me. Incidentally, he never received many of my letters, even though I tried to avoid broaching political issues. In one three-page letter I described my impressions of a symphony concert that I had attended. Vasyl never received that letter. This annoyed me, and I recreated my letter from memory. But it didn’t go through either. In prison Stus was translating Goethe and asked me to send him the metrical scheme of Alexandrine verse. When he didn’t receive my reply again, I re-sent the letter with the inscription: ‘Dear comrade censor. This is a scheme of ancient versification. I earnestly request you to let this letter pass.’ Can you imagine? It did come through! “I have a memory for events. I remember bright and memorable episodes with all their details, moods, and smells. In the summer of 1966 I was expelled from the party. This saga lasted for eight months. I was very nervous at first, but then let it pass. I even started to speak in aphorisms. It seemed that after a few more visits to different institutions, I would have started speaking in verse. At the regional party committee a man with ‘a human face’ asked me, ‘How do you feel now that you are parting with your party membership card?’ I answered him instantly, saying that I had joined the party at a young age with a sincere belief in ideals. When life requires me to choose between ideals and a card, I choose to keep the ideals and return the card to you. “As a writer, Borys Dmytrovych was known for his truthfulness and explicit ideological ideas that may perhaps seem somewhat old-fashioned today. On the other hand, his works are filled with existential substance. He experienced and knew from first-hand everything that he wrote about. But, as I’ve said before, he was his own best work. He was an exceptionally pure person, who contributed greatly to our generation’s spiritual development. It was from Antonenko-Davydovych that we first heard about the events that happened in the age of the Ukrainian National Republic — four universals and Day of Unification on January 22. He was our spiritual guru. “We became very close in the last years of his life. His wife was mentally ill and his son had served three prison terms. The authorities were obviously using the boy. For example, during their crackdowns on drugs the police took his father’s memoirs about his service in the Ukrainian Army, the tumultuous postwar years, and the establishment of the new Ukrainian literature. After his wife died and his son was in prison, I moved in with Borys Dmytrovych, who wanted to marry me. And that’s when the whole saga began to unfold. People went out of their way to prevent us from registering our marriage. Once we received a fake letter, allegedly from the Writers’ Union, which contained a newspaper clipping from Vechirniy Kyiv about a swindler who had cheated an old man out of his apartment. There were lots of libelous rumors, statements from his son, etc. Borys Dmytrovych wanted justice and filed complaints with various courts. I had a whole file of documents that I deposited in an archive. I might publish it someday. In the end, I was forced to leave, and he was found mentally incompetent and placed in the care of his daughter. “We have planned a multivolume edition. Two books have already been published. Vyacheslav’s sister Valentyna and I have prepared an absolute hit of the season — two volumes of his correspondence. He sent many letters to his family — his sister, parents, wife Atena. There are letters to his son Taras, whom he tried to educate through letters, much like Stus did with his son. There is a wonderful letter in which Vyacheslav Maksymovych thanks Zynoviy Krasivsky, the famous dissident and Taras Chornovil’s stepfather, for taking care of his son. So, Taras did not grow up without a father’s guidance. “The book Moyi obriyi is very dear to me because it is the first time that I was able to collect my life’s work. I have also included my older works, which of course could not have escaped the seal of those times. Fortunately, there are not many of these politically-colored works. A good friend of mine looked at this publication and said: ‘Well, now you can die in peace.’ I replied that I’m not going to do that just yet.